EMAIL OR FAX PROOF to Flanagin’s before you print. ORDER ENOUGH PIECES to cover the full mailing plus 5-10 extra. CHOOSE PERMIT (see reverse side) Have permit pre-printed on your piece where a stamp would normally go. If you are uncertain which permit call or email. ADDRESS BLOCK & BARCODE SPACE. An easy safeguard is to leave the lower right-hand corner completely blank. 3 .” x 2 1/8”. Email or Fax us your proof before printing so we can approve for postal qualifications. ASPECT RATIO. Measure your mail piece. Length divided by height must be more than 1.3 or less than 2.5. SELF-MAILER TRI FOLD The address panel should be the middle panel and on min 28# paper. NO AQUEOUS / UV / OR VARNISH COATED PAPER. Our ink will not adhere to coated paper, it will just smear. Request the mail side free from coating. It if comes coated, we will have to apply labels at an additional charge. FLAPS DOWN if you are bringing already stuffed envelopes that you want us to seal, please keep the flaps down and all envelopes facing the same direction. IDENTICAL PIECES A bulk mailing MUST be identical. That means color, weight, and text. Even a poor cut will affect the weight so be sure they are cut professionally. PRE_PRINTED LABELS will cost you more in postage (electronic lists recommended). We cannot get you the best postage if you pre-print labels or pre-address your mail. DATA Preferred format is excel, dbase or .csv Do not send us your data as a PDF file. Send your data by email attachment. GOOD IDEA to add your own name to your mailing list so you will know when the mailing starts to arrive. 28# PAPER minimum weight. USPS requirement (20# paper is too thin so be careful when purchasing. Thin paper will not go through the folder, wafer tabber, inserter or USPS equipment properly. NON-PROFIT Mail qualifying for Nonprofit Standard Mail prices must have the name and return address of the authorized nonprofit organization either on the outside of the mail piece or in a prominent location on the material being mailed (inside the mail piece) (703.1.5 USPS DMM). POSTAGE IS DUE BEFORE THE MAILING GOES OUT. Company check, cash or credit card accepted ( with credit card there will be a service charge of 4% added to the final invoice total). MOVE UPDATE REQUIREMENT All discounted mail must have proof of move-update. Move-updates are good for only 95 days. 4) Have us send your list through National Change of Address at 2 ¢ per submitted record. You will receive a report of all moves located to update your master database. Preferred option for overall savings. Reduce postage, printing, & labor on all future mailings. 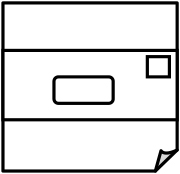 ENVELOPES Prefer machine insertable envelopes for all styles. Invitation style envelopes with square flaps have to be hand sealed so there is an additional surcharge for square flaps. Good alternative for square flap envelope would be Western States Sulphite 7056 A- 6 4 . x 6 . or comparable. 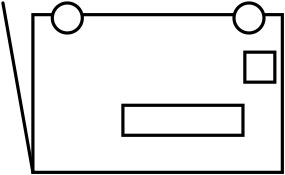 EDDM ADDRESS AREA. If you are doing EDDM mailing. The following should be pre-printed on your mail piece. Call for EDDM requirements and step by step instructions to the USPS maps. Postal customer = business & residential – Residential customer = residential only no businesses. 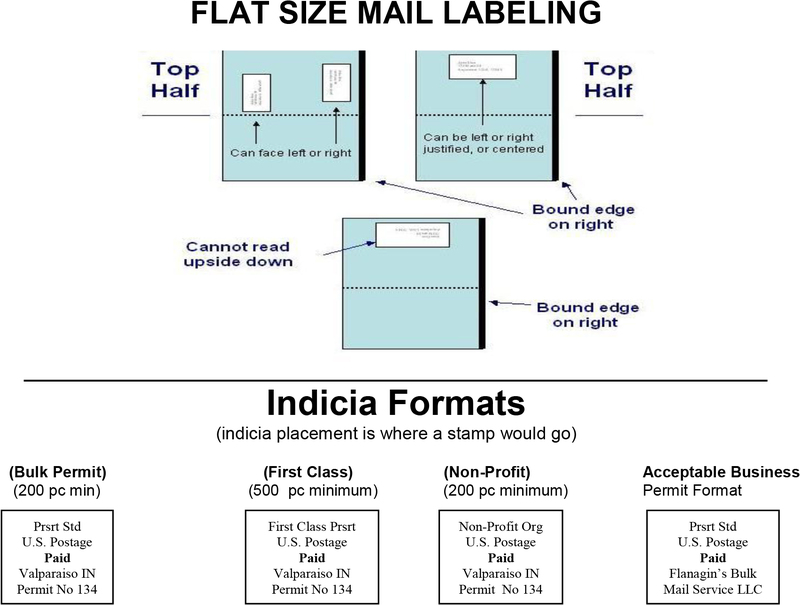 FLAT SIZE MAIL Acceptable labeling areas for flat-size mailings.